News: a design team led by London firm Grimshaw has revealed plans for a new six-runway airport in Istanbul capable of accommodating up to 150 million passengers a year. The Grimshaw-led team, which also includes Norwegian firm Nordic Office of Architecture and London studio Haptic, says the Istanbul New Airport Terminal One will become the "world's largest airport terminal under one roof", covering a site of nearly 100 hectares. 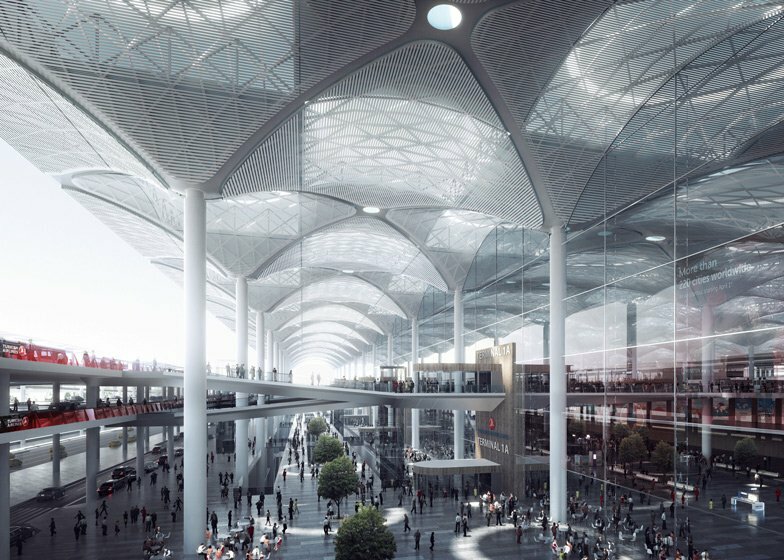 Described by the designers as "modern and highly functional, with a unique sense of place", the terminal will feature a vaulted canopy dotted with skylights. These will focus daylight onto key sections of the interior, including check-in desks, passport control and shops. The airport will be located 20 miles outside the city on the Black Sea coast. It will be built in four phases, with the first expected to open in 2018 and serve up to 90 million passengers a year. A large plaza and transport hub will be built at the entrance, allowing the airport to integrate with existing rail, metro and bus routes. Grimshaw recently completed an airport in St Petersburg with golden ceilings, designed to reference the gilded spires of the Russian city's churches. But partner Andrew Thomas says this new project will aim to capture "design worthy of the world city of Istanbul". "The Istanbul airport attempts to reconcile the requirements for a top modern, functional airport with something that is rooted in local identity," added Haptic director Tomas Stokke. "We were inspired by the local use of colours and patterns, the quality of light and how it penetrates buildings, as well as by traditional architecture such as the Süleymaniye Mosque."